The MKS series was recently introduced as part of Lincoln’s lineup of full-size luxury sedan cars. 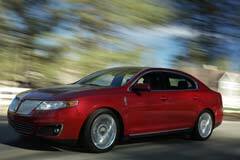 Due to its price, used Lincoln MKS models sell faster than new ones. Lincoln used the Ford D3 platform for the car. The 4-door sedan was available with two engine options, a 3.7 liter V6 running at 273 HP and a 3.5 liter V6 running at 355 HP. Transmission was facilitated by a two versions of a 6-speed automatic gearbox. The exterior was marked by a large grill with chrome elements and headlights that were placed to create an edge to edge seamless line in the front. Two fog lights were added on the sides of the central air vent. Lincoln moved away from its habits in terms of interior design with the MKS model featuring modern concepts using pearl white and dark suede. Technological features included Bluetooth connectivity, navigation system, a 500-watt audio system and a driver identifying system.